Old Ford with Rat Rod potential Photo Picture Classic Cars for sale & Classifieds - Buy Sell Classic Car & Classic Truck Classifieds. Andrew Dierdorf sent us this photo and story. " The attached photo is a photo I took of an old Ford that has been sitting so long that a large tree has grown right between the frame rails. The man that owns the truck took the motor apart when he was a kid, but his father was so mad at him that he wouldn't help the boy put it back together." Thanks Andrew! Theres a 48 Plymouth at my place with a tree growing through the hood. The tree fell over, but luckly missed the car. I hope the tree doesn't fall on this truck! It's been sittin there since the owner was a kid? Wow! that must be a find. Can I get it? Hard to believe that no one bought, stole, or took the hood, lights, grille, etc after all these years. The truck looks as well care for as the house. Wish my 250 powerstroke could carry a load that well. 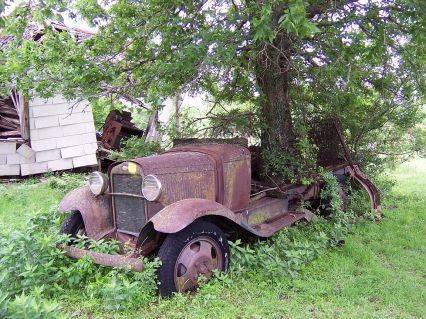 That is right where Granny parked the ole girl back in 22!!! How much for the tree? If I was going to move the tree, I would take the truck with it!!!!! Looks like the only thing worth saving here is the tree. Give's an all new meaning to 3on the tree..
some important words apply here. HUSQVARNA and FLAT-BED. That father sure taught him a lesson. That sure has been sitting there a long time. That would be cool to have in the back yard.